Neag Endowed Professor of Teacher Education and AERA Fellow Suzanne M. Wilson has been named head of the Department of Curriculum and Instruction (EDCI) at the Neag School. She takes over for Mary Anne Doyle, who served as department head for 17 years and returned to a faculty role to focus on literacy research. Wilson, who arrived at the Neag School in 2013 from Michigan State University, was one of 17 new faculty members recruited to the Neag School as part of the University of Connecticut’s ambitious hiring plan. 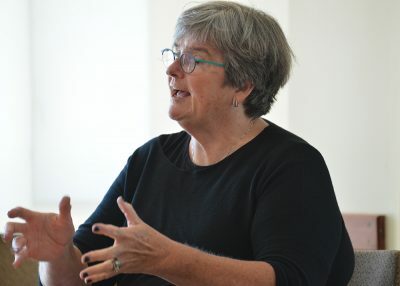 In addition to being a University Distinguished Professor at Michigan State University (MSU), Wilson also previously served as chair for MSU’s Department of Teacher Education, where she was a faculty member for 26 years. While at Michigan State, she raised millions of dollars for grants with colleagues. Most notable was a $2.5 million National Science Foundation grant for a research project with the American Museum of Natural History. When she arrived at the Neag School, she secured a grant for another $2.9 million for a project focused on moving the Next Generation of Science Standards into practice, along with several other grants to study mathematics and science teacher learning in early career and professional development programs. She will continue her grant work for another two years and wrap up a book she has been working on about teacher preparation. Wilson says she sees the role of department chair as institutional and professional service. “One mission of the University is service, and being a department chair allows you to support faculty in pursuing their interests while also working on program development and new research and/or outreach collaborations,” she says. Using her experience leading a large department at MSU, Wilson says she will work to advance the Neag School’s strategic plan, including continuing the substantial faculty-led revisions of the Teacher Preparation Program, and work focused on equity and social justice, STEM initiatives, creativity and innovation, and educator quality. “UConn has a very highly regarded teacher education program, so my experiences being supportive of faculty and staff, and working toward having strong teacher preparation, will hopefully help,” she says. Since arriving at the Neag School, Wilson says she has enjoyed getting to know the faculty — long-time and newer additions— and developing cross-generational relationships. “A lot of the new faculty come from different backgrounds and perspectives, and learning from them is very exciting and invigorating,” she says. Wilson says she looks forward hearing from EDCI faculty and students, and learning about their interests and concerns. She also notes the importance of keeping an eye on the political, intellectual, and economic environment, and anticipates helping the department think about new kinds of programs and services that respond to pressing needs in public education. “I’ll be looking at how we can develop programs and resources that are relevant and appealing to the larger Connecticut public to whom we’re responsible,” she says. Wilson earned her Ph.D. in education and her master of science degree in statistics from Stanford University, and her bachelor degree in American history and civilization from Brown University.